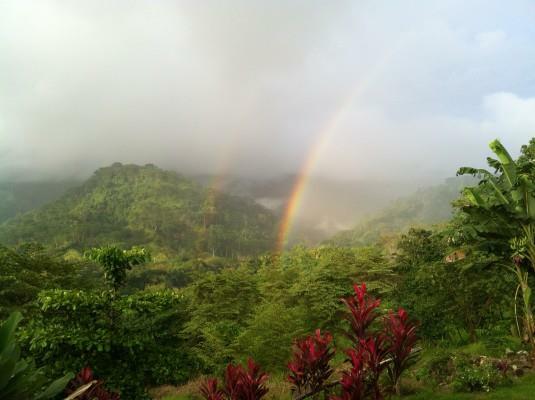 Blogs, pictures and articles about Costa Rica. Q. What are my rights as a non-Costa Rican buying property in Costa Rica? One of the main attractions of Costa Rica real estate is that you have the same rights as any Costa Rican resident to own titled, fee simple property in Costa Rica. If you are buying CONCESSION property (which I don’t list or sell), there are restrictions if you are not a naturalized citizen. However, I only list, represent and sell FEE SIMPLE, TITLED PROPERTY, in which you are 100% eligible, entitled and protected under Costa Rica law to own property here. Q. What are the costs typically involved in the purchase process in Costa Rica real estate and do I need a lawyer for the transaction? You must use a lawyer for any property/title transaction in Costa Rica, and the Buyer is typically responsible for closing costs and the legal fees, so this is good information to know prior to making an offer. The lawyer is a key player in the transaction as their duties include legal representation and counsel, due diligence and background check on the property, registration of property deed, and certified public notary for all documentation. As a rule, your lawyer should be bi-lingual (if you don’t speak Spanish), with an office and website, dependable, computer literate, and with a good work ethic etc. and remember, NEVER deposit any funds into a lawyer’s personal account or seller's account, alwasy use a registered escrow account. If you lawyer doesn't have an escrow company, this is a red flag. Q. What law firm do you recommend? Q. What are the typical closing costs and legal fees? Here are the basic fees that you’ll need to know about, all percentages will be based on the actual Purchase Price. Please note that sometimes Sellers want their own lawyers to check the documentation; however that is not part of your expense. Q. You mention “corporation”, why should I use a corporation to buy and sell property in Costa Rica? The assignment of corporate shares can be divided as needed in the case of multiple owners. Q. How do I get a corporation? In many cases the seller will sell his property with the current corporation and all shares will be assigned to you as the new president of the corporation. This helps save money on closing costs (approximately 0.8%, as well as $800 dollars for a new corporation). Your lawyer will perform a background check on the corporation to make sure there are no liens, lawsuits, encumbrances etc. After the background check the lawyer will advise that you can proceed with buying the property with the corporation, or, recommend that you buy the property with a brand new corporation. Q. And what are the steps involved in making an offer and closing? Here’s a brief description of the steps involved. I will create a LETTER OF INTENT for you that we will send to the seller which will outline the basic points of the deal (price, terms, timeline, etc). You will need to deposit 10% of the purchase price into escrow to take the property off the market and lock in the terms. When deposit is confirmed, your lawyer performs the due diligence on the property and gives you the results. I also help at this stage to assemble all paperwork, and/or receipts proving that all bills, taxes, etc are paid up to date and all services are in good standing. You can also order a home inspection at this point if desired. You have 48 hours after the due diligence report has been finished and sent to you, to either proceed or cancel the deal. If you cancel at this point, your deposit is fully refundable. If lawyer recommends proceeding and the due diligence report is acceptable, we move to the closing stage. Once a closing date is set, the balance of the funds are sent to escrow. On the date of closing, paperwork is signed and notarized by the necessary parties, funds are wired from escrow to the designated account(s), and new ownership information is duly registered in the public registry. Q. What about getting financing with a Costa Rica bank? Costa Rica Banks typically don’t loan to foreigners unless you have property free and clear already in country that they can use for collateral. There may be some exceptions but the application process is lengthy and tedious. You are better off considering owner financing or getting a home equity loan in your home country to leverage your Costa Rica transaction. In the case of buying in a new development, there may be developer financing available as well. Regarding the increasingly common option of Seller/Owner financing, these terms can vary but here’s an example of what I’ve seen lately in this kind of arrangement. Half down (or more) at closing. Balloon payment of the balance in three to five years (or sooner). “Interest only” style of loan (you are paying interest on the balance, this resets every year. Interest only loans do not pay off the principal so it’s basically just buying you time). Percentage rates can vary but are usually in the 4% to 8% range. You can pay off additional principal in small balloons if you want and that could lower your interest payment accordingly. Property is annotated with a registered mortgage lien or in other cases in a Guaranteed Trust. With a purchase price of 195k, let’s say Buyer paid 100k at closing and Owner financed 95k for three years with an interest only rate of 7%. Buyer would be paying $6650 a year every year in interest until Buyer paid off the 95K in a balloon at the end of the term or sooner. Remember, Buyer can reduce your interest payment if you make some smaller balloon payments prior to the end of loan term. Q.What about taxes and insurance? Taxes and Insurance are about the same amount, and cheap! Taxes are 0.25% of the registered purchase price per year. And basic insurance is about the same. So for a house valued at 200k, we are talking $500 dollars per year. Basic insurance is for flood, earthquake, rain damage, tree damage etc, again about $500 per year for a home valued at 200k. Inventory Insurance for personal belongings, (inside the house) is an additional fee based on your inventory; the insurance company will come out and give you an assessment and estimate for that. What about costs for Maid/Pool/Gardener? Manual labor for maids and gardeners can run from $2 to $ 4 dollars an hour and a pool guy will run you about $50 dollars a month for most average size pools this will include all chemicals. PLAYA HERMOSA, BIG TIME SUN AND SURF! 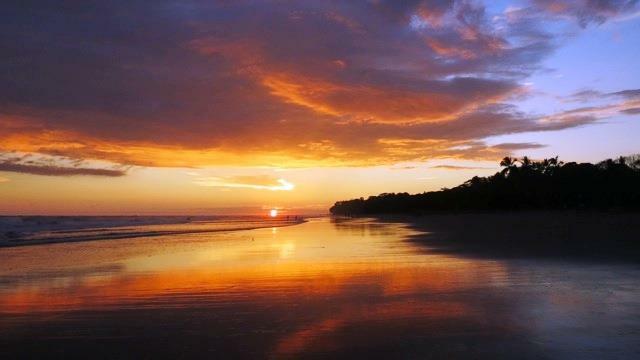 There are two beaches with the name “Playa Hermosa” in Costa Rica. One is in the Central Pacific (just south of Jaco), the other in Guanacaste (Northwest Costa Rica). The Playa Hermosa in the Jaco area is a long expansive beach of cinnamon colored sand and is home to one of the most consistent surf breaks in Central America. However, despite its growing popularity, it still retains its laid back “pura vida” vibe and gorgeous natural setting. This “Blue Flag Winner” beach is only a 1.5 hour drive from Costa Rica’s main International airport in San Jose, and is just 1 mile south of Playa Jaco. Hermosa can be easily reached from the Coastal Highway (HWY 34). Playa Hermosa (Hermosa means “beautiful” in Spanish) boasts plenty of wide open and pristine shoreline, yet with a conservative number of hotels, restaurants and bars that dot the shoreline. As testament to its consistent surf, Playa Hermosa has surf competitions almost every weekend throughout the year, and most famously hosted the 2009 Billabong Surf World Championship. The beach was packed with spectators and participants from all over the world, and the waves did not disappoint! 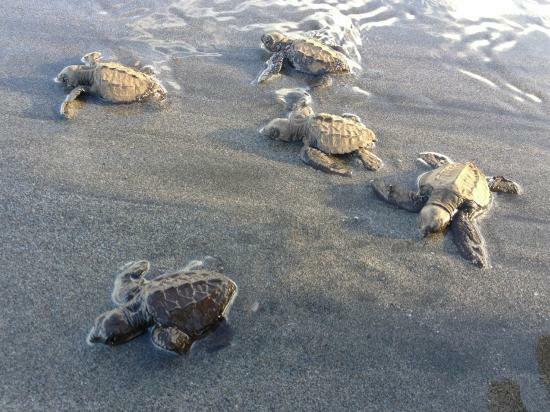 A visit to Hermosa may include walking or driving along the unpaved ocean road to the extreme south end of the beach where there is the Hermosa Wildlife Refuge, a sanctuary and nesting spot for Olive Ridley Sea Turtles that instinctively travel thousands of miles to come ashore to lay their eggs. When they hatch, the baby turtles, also by instinct, make their way out of the broken egg shell and across the sand to the open ocean in a spectacular, unforgettable, and emotional display of Mother Nature at work. 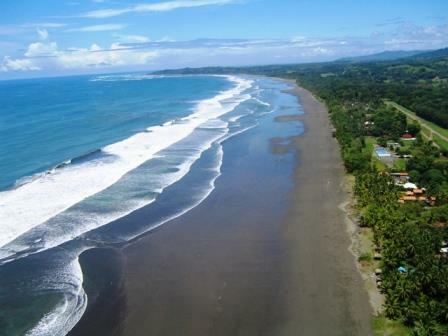 This beach will maintain its minimally developed feel for years to come as there are very few titled beachfront areas in Playa Hermosa, however, I do have these fully titled beachfront options on my site and please contact me to discuss them. As Natural conservation is important in this area, most residential offerings are a few miles from the beach. 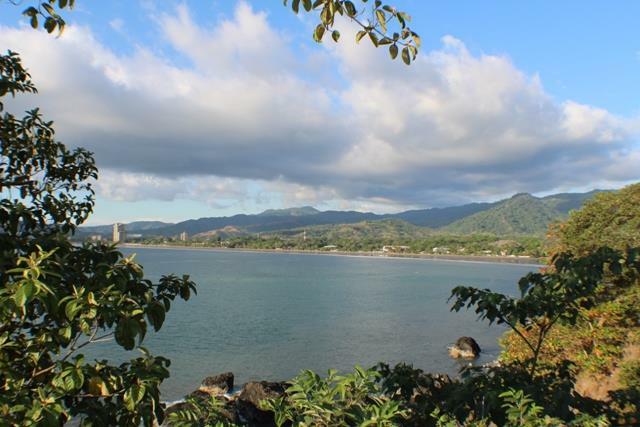 These properties are an excellent opportunity for the buyer that wants a pristine, minimally crowded shoreline of big surf and natural beauty, yet very close to major amenities and conveniences. I also have listings in the hills and bluffs above Playa Hermosa which feature panoramic, breathtaking ocean, mountain and sunset views. Some ocean view locations are more impressive than others but compromise can come into play as some roads are 4x4 only in the rainy season. I am 100% “brutally honest” regarding all of my listings and would be happy to share with you my opinions regarding the rewards and challenges with each listing. Fortunately, I believe that if you have decided on Costa Rica, than I have something for everyone in this area; let me use my expertise and experience to guide you to the best opportunities that fit your needs. Please call or write regarding any of my listings or for further information regarding the Playa Hermosa area. Where are Bejuco and Esterillos Beaches?!! These areas, pronounced Bay-who-co and Ester-eee-ohs, are south of Jaco but still in what I consider the Jaco Area. While Jaco is the epicenter of growth and entertainment in the Central Pacific, it’s not for everyone. Fortunately, there are a variety of locations in the area for those that want to be close to Jaco, but not IN Jaco proper. 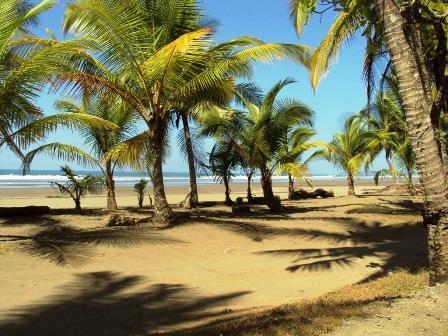 So let’s take a little drive south…But wait, before we get started, note that there are two Playa Bejuco beaches in Costa Rica, and there are two Playa Hermosa beaches in Costa Rica. 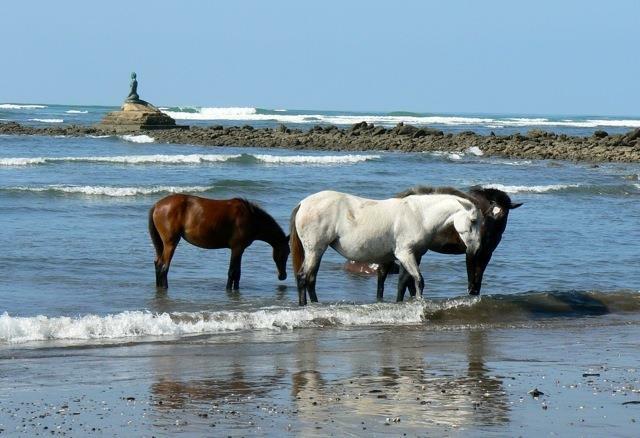 The Playa Bejuco and Playa Hermosa in the Central Pacific are the ones referred to in this blog and in all my listings. 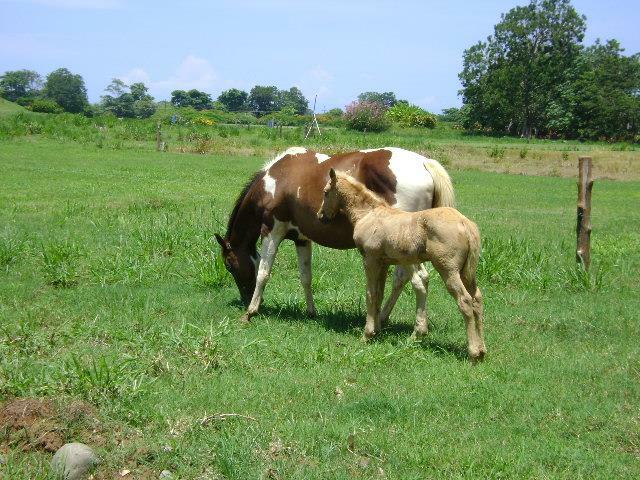 The other two are in the Northwest province of Guanacaste, Costa Rica. Heading south from Jaco on Highway 27, the beautiful coastal road, flat through Jaco, begins to climb and skirt ocean bluffs above the endless Pacific, offering wonderful views and plenty of places to pull over for photo ops. Even after over 10 years of living in this area of Costa Rica, the “embarrassment of riches” of natural scenery here never fails to impress me and put me in a good mood. Talk about a great commute! Especially after all those years battling California traffic jams on a daily basis. Life is too short for that grind. The highway begins to flatten out as you cruise south through Playa Hermosa on the “Costanera” (Spanish for Coastal Road) through rice farms, stands of teak trees, immense green pastures and jungle covered hills. The ocean is no longer visible on the right as the scenery changes. 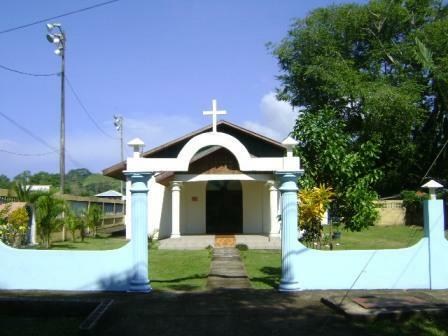 It’s now farms and meadows, the scenery dotted with an occasional herd of horses or cattle, a few small clusters of buildings, a modest country church, a school yard with local kids in their light blue uniforms, soccer fields and roadside restaurants, and the ubiquitous Costa Rican public bus stop. After about ten glorious miles, you’ll see signs pointing to the entrance roads (there are two) to Playa Esterillos Oeste. The “playa” (playa=beach in Spanish) is not visible from the highway. However, let’s pull off the highway as we can be on the sand at Esterillos Oeste in about two minutes. The town of Esterillos Oeste features a supermarket (called Super Sol), a handful of small restaurants, hotels and bars and a few locals meandering around the bus stop or checking out the surf. Once considered an area ripe for a development “boom”, the town now has reverted back to a sleepy seaside Costa Rican backwater, and that’s just how some people like it. In my opinion this town has such a beautiful beach, but it’s looking a little rough around the edges these days. The area is positioned for a comeback and we hope that the comeback is a result of a period of sustained growth and responsible development. While the big developments in Esterillos Oeste have been shelved for the moment, there are a couple of modest gated communities here with homes averaging in the 125k range. Not much to do in the town itself at the moment, but plenty of beautiful beach to enjoy. 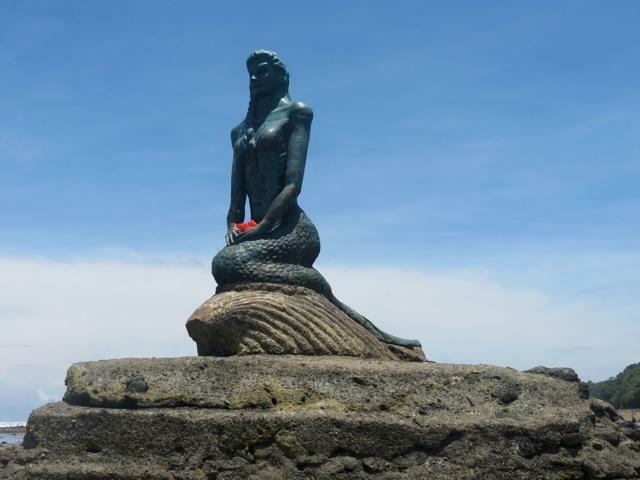 In fact, this is one of my favorite beaches in Costa Rica, there is a huge amount of wide open smooth beach lined with coconut palm trees (careful where you park or sit), there’s a great section of tide pools and an awesome bronze statue of a mermaid out on a large rock! After we’ve walked out in low tide to check out the mermaid, let’s get back in the car and head back to the highway. We’ll pass one of the few gas stations in the area, pay about 50 dollars to fill up our Toyota Rav 4, and maybe grab a bite to eat at the Restaurante next to the gas station (the name changes every six months, so I won’t put the name, in fact I can’t even remember what the current name is). We get back on the road, head south and within about a minute we see more beaches visible on our right side. These beaches are really a continuous ten mile long section of coast, separated by rivers and tidal inlets, which create natural breaks, consequently dividing the coastline into four separate palm tree and jungle lined beaches. These beaches are called Esterillos Oeste (east), Esterillos Centro (center), Esterillos Este (west) and Bejuco Beach. Esterillos is Spanish for “estuary” and Bejuco is Spanish for “vine”. These areas are much less populated than Jaco, yet are only a 15 to 20 minute drive away. 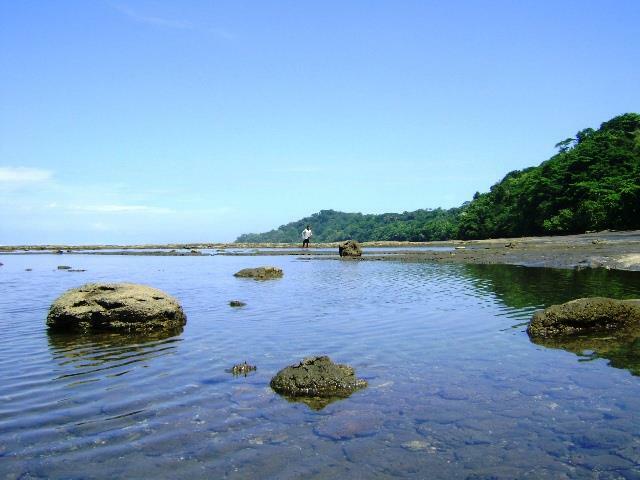 And, unlike other areas of Costa Rica which can become very dry and brown in the long Costa Rica dry season, these beach areas remain green year round, lush with tropical vegetation, and lots of un-crowded, beautiful, serene beach spots, country roads and pastoral scenes. We offer several listings in this area, all within a short drive or walking distance to the beach. There are a few grocery stores in the area, some great restaurants and hotels. Outdoor activities include horseback riding, ATV touring, surfing, swimming, hiking, fishing, birding, sunset gazing, hammock lounging, etc. There are tide pools at Esterillos Oeste as well as a turtle sanctuary, and some of our most popular and sought after residential options at gated communities within 200 yards to the beach at Bejuco. Bejuco beach is the last beach on our southernly route and the furthest southern beach in my market area. It also happens to be one of the best. Playa Bejuco is the last good beach before Costa Rica's most popular national park, Manuel Antonio National Park, which is another 30 minutes to the south. Bejuco has two of my favorite gated communities, just 200 meters (yards) from the beach, and both communities have brought me many clients who've now become friends over the years. I am grateful to live in this wonderful country and look forward to showing my clients the posibilities that exist for your future Costa Rica Dream Property. 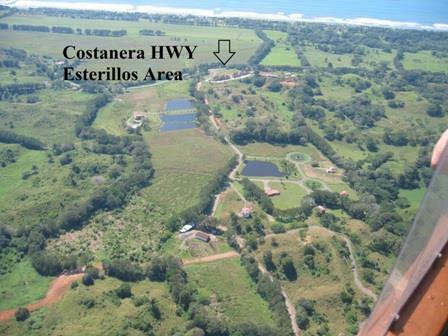 Remember that you DO NOT have to be a resident of Costa Rica to buy and sell property here. Residency and your passport status are totally separate from you as a property owner here in Costa Rica. However, if you are planning on staying here full time, opening a business here, or visiting frequently for longer than a 90 day term, residency can make life easier! Costa Rica typically grants a 90 day tourist visa to visitors from the USA and Canada, which means that if you are visiting Costa Rica for more than 90 days you will need to leave the country to renew your visa. Once you leave you can return immediately to Costa Rica and have another fresh 90 day stamp on your passport. There is no limit to the amount of times you can do this as a “perpetual tourist”, and many property owners in Costa Rica enjoy this option as an opportunity to take a day trip to neighboring countries via car, bus or air travel. Panama is a popular destination for many reasons, the Panama Canal, Panama City, the incredible and "lost in time" Caribbean Coast. It is also a popular shopping destination as goods such as electronic items and appliances as well as liquor and other goods can be bought cheaper in Panama than in Costa Rica. However, please note that buying large quantities that are obviously over and above personal consumption can be deemed suspicious and can be confiscated at the border. Use common sense! Another popular destination is the bordering country to the north, Nicaragua. Popular Nicaragua destinations include the original Spanish capital at Granada or the beach destination of San Juan Del Sur. Nicaraguans are friendly, the country is safe, prices are low and the culture is rich. If you are seeking permanent residency in Costa Rica, it is essential you find a reliable experienced law firm that has attorneys specifically savvy in Residency Procedures and the office of Immigration. Obtaining residency can be a lengthy procedure and you will need guidance and clarity in gathering the proper paperwork needed for your application. With residency it is easier to do banking, get a driver’s license, and not have to leave the country every 90 days. Please call me or write regarding more specific information about types of residency and requirements and my recommendations on which law firms can help. Please see this site for more information. WEATHER RELATED PROPERTY MAINTENANCE IN THE TROPICS. While we love to boast about our “Garden of Eden” setting here in the Central Pacific of Costa Rica, the tropical heat, humidity, sun and rain, rapid growth of flora and fauna, etc. can all take its toll on your property. The closer you are to the beach, the higher the collateral damage done by salt water air. Appliances can and will oxidize and rust and any exposed metal will show signs of deterioration as the elements take their toll. Rainy season is also dubbed the “green season” as it is characterized by explosive growth of anything that is considered part of our amazing Plant Kingdom. The thirsty, dormant terrain quickly bursts back to life in an amazing array of vibrant colors. You will witness your lawn start to look like a meadow, hanging plants start to outgrow their pots, gardens travel beyond their fences, shrubs get shaggy, trees will act as if on steroids and can seemingly grow right in front of your eyes, especially fruit trees. It’s a wonder to behold and we love this, but unchecked growth can damage your property with falling trees, ground littered with rotting fruit, clogged rain gutters, spore growth on exposed areas where mold can start, ivy and grass climbing the walls, etc. A tropical downpour can wreak havoc if your rain gutters and drainage systems are not clean and in good shape. A roof that is not in excellent shape can and will show it’s weaknesses in the rainy season as well. A gardener, very cheap to hire in CR, is a big help in cutting and trimming during the rainy season (approx. June to November), and to a much lesser degree in the dry season (December to May). DRYWALL… keep an eye on drywall as the seams are the first to show humidity damage with falling tape. Make sure your home has a protective coating over any exterior drywall (typically roof eaves), and/or use drywall that is explicitly used for exterior use only as it will have a protective coating to protect against the elements. HUMIDITY… Humidity in the central pacific coast of Costa Rica averages around 70%, and has its own disruptive affect on everything from electronics and moving parts to mold spores in darkened, closed up areas. It is in your best interest to have someone turn on your appliances from time to time, start your car, to open up your house to rid the home of mold spores, to wipe down cabinets and counter-tops and to let the mold killing properties of sun and fresh air do their duty to keep your home and belongings smelling and looking good. 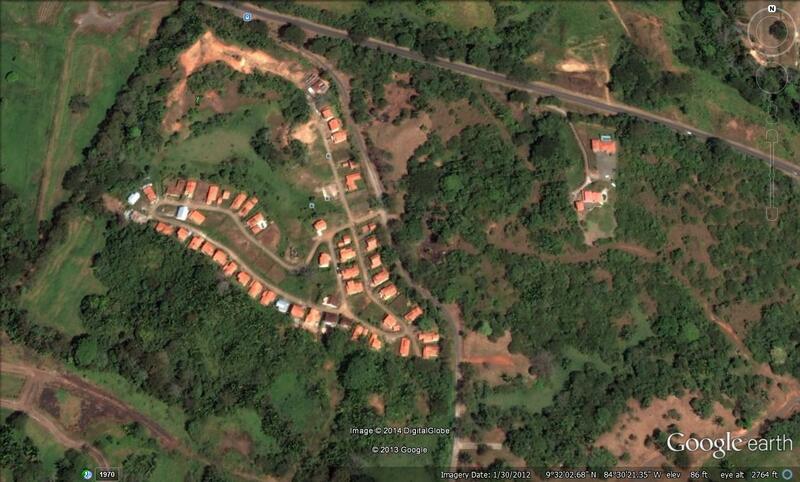 SECURITY AND COSTA RICA GATED COMMUNITIES, WHY OR WHY NOT? Gated communities are an excellent option here in the Central Pacific Coast of Costa Rica for many reasons, mainly, PEACE OF MIND, which is priceless, especially when owning property in a foreign country. With your Costa Rica property you will really want to focus on eliminating or minimizing the “headache factor” as the distance, language, or cultural barriers can make even the most mundane task challenging. Not to worry! Many have come before you and helped pave the way to make this process a bit easier. Many Costa Rica homeowners are using their property as a vacation rental or part time residence, which means that their Costa Rica property is going to need security and TLC in their absence. Gated communities and good property management are huge factors in addressing this need. A well organized and well run gated community should greatly lessen or eliminate the need for security concerns, as well as provide maintenance options while you are away, property management if you are renting your property, and other common sense concerns that an absentee owner must bear in mind for their Costa Rica property. A condominium is probably the best option if security, maintenance and management for you and your renters outweighs your need for a free standing home. However, many clients are simply not interested in condos, but rather a free standing home situated on a lot or larger parcel of land, with or without private pool. For those of you that are opting for HOMES rather than condos, I’d like to share some basic characteristics of what to look for in gated communities here in Costa Rica and the pros and cons to consider. I get this question all the time, “Is Costa Rica safe?” Your current home in the USA or Canada might be in a neighborhood or zip code where even though you are not in a gated community, you feel you never have to worry about crime. But Costa Rica is still a developing country and in the Central Pacific area we are still considered mainly a rural beach environment with the exception of the large beach town of Jaco. Violent crime is NOT common in this area but petty thievery can be a factor if you do not use common sense. For example, if you live out in a rural setting, and you have not taken at least the minimal logical precautions, chances are you will have a break in. Where your property is in Costa Rica, and what logical level of precaution needs to be taken should be discussed as you are conducting your due diligence on the property. I would be happy to discuss each and every property on my site and what the situation is with regards to crime. LEVELS OF PRECAUTION AND PROTECTION can vary, given the circumstances of where your property is located. Precautions can include but are not limited to the necessity of having dogs or fences, or a security guard or caretaker, alarm or camera system. Usually break-ins happen when the owner is not home for an extended period, for example, if you are travelling and your home remains empty, the typical case being petty thieves that break in through a window in order to steal what they can carry off and easily fence. If you are travelling throughout Costa Rica and you leave your car unattended and packed with tempting personal belongings that can be spotted through the window. That is what I consider an unnecessary risk. Muggings and stick ups are basically unheard of here, this is one of the most peaceful countries on the planet, but like anywhere, crime happens and usually a break in is a crime of opportunity. It’s easy to get caught up in the “Paradise Found” look and feel of Costa Rica, but that’s no reason to be naïve. The rule of thumb is to make it difficult for would be thieves, not easy. Personally, I do not believe you need guns, razor wire and to live in fear in a prison-like setting, but you have the responsibility to not look like a target. Gated communities are great in alleviating these concerns, so you simply don’t have to worry about a break in. You are paying a monthly fee and in turn you have security, right? In most gated communities where there is a defined, easily patrolled area with perimeter fencing and a monitored entrance and exit, it’s usually a no brainer. HOW “GATED” IS YOUR COMMUNITY? But is the gated community a vast, sprawling area of oversized lots and hills and valleys and jungle, perhaps with no fencing? Just because there’s a front entrance with a guard shack doesn’t make it a Gated Community!” Where are the entry and exit points for those in cars and on foot? What is the security strategy of the guards and how do they patrol a larger area? Logic would dictate that you ask about this if you are considering a home in a vast development. I have found that some realtors and developers tend to gloss over these concerns as their priority is to make the sale. I stand by my clients in evaluating the feasibility and history of the security team in relation with what can be difficult characteristics of the area they are appointed to patrol and secure. It’s nice to have friends and neighbors especially if you have some things in common. 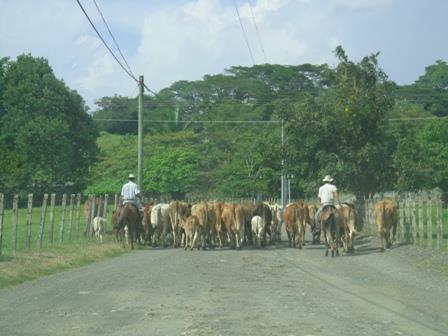 Gated communities in Costa Rica are full of a wonderful mix of people of varying backgrounds and cultures. Be it Americans, Canadians, Costa Ricans, Europeans, or other expats young or retired, with or without kids, working in the area, or working from home, social or non-social, it runs the gamut. But one characteristic that can really be an advantage with neighbors is networking. We all need help, especially as a “newbie” to Costa Rica. We may need repairmen, property managers, doctors, lawyers, mechanics, advice on schools, shopping, traveling, sightseeing, dangers and annoyances, social events, etc. Truly there is great value in having good neighbors to advise as well as socialize with. I find it an invaluable advantage to having this and it’s much easier to find when you are in a gated community. Many have come before you and can help you with the adjustment phase to your new home and surroundings. 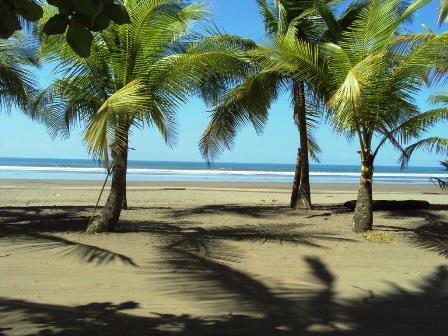 There is plenty of beautiful beachfront property for sale in Costa Rica. Everything from fishing camps to luxury hotels to restaurants to homes and condos, boasting locations right on the sand! But why can beachfront lots in Jaco range from $500 to $1000 dollars a square meter (depending on size of parcel), and yet the square meter price in Playa Esterillos or Playa Bejuco (just 20 miles away) is only $175 dollars a square meter or even less? You’ve seen the ads, beach sunsets and scantily clad couples sipping piña coladas while walking on the beach. Everyone wants to be beachfront, so what’s the rub? 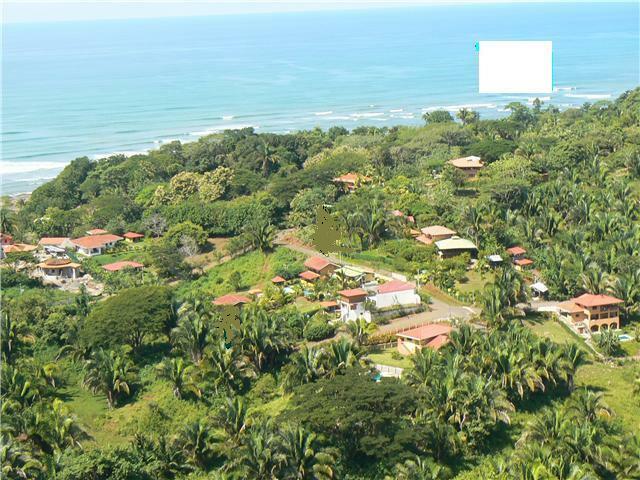 The fact is that Jaco Beach Front is 100% TITLED property as well as certain spots in Playa Hermosa to the south, while most of the other beaches in Costa Rica are CONCESSION property. 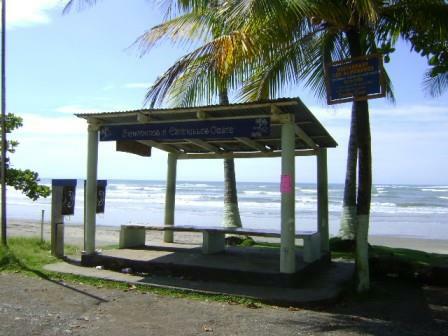 Costa Rica Maritime Zone law (Ley sobre la Zona Maritimo Terrestre) published in 1977, is the all set of laws that govern the first 200 meters of land measured from the high tide mark on any beach in Costa Rica. The law states that the first 50 meters from the high tide zone is deemed public land, and no private individual can own that land except for official marinas and ports (remember, 1 meter equals 1.09 yards). The next 150 meters is deemed TITLE or CONCESSION property. 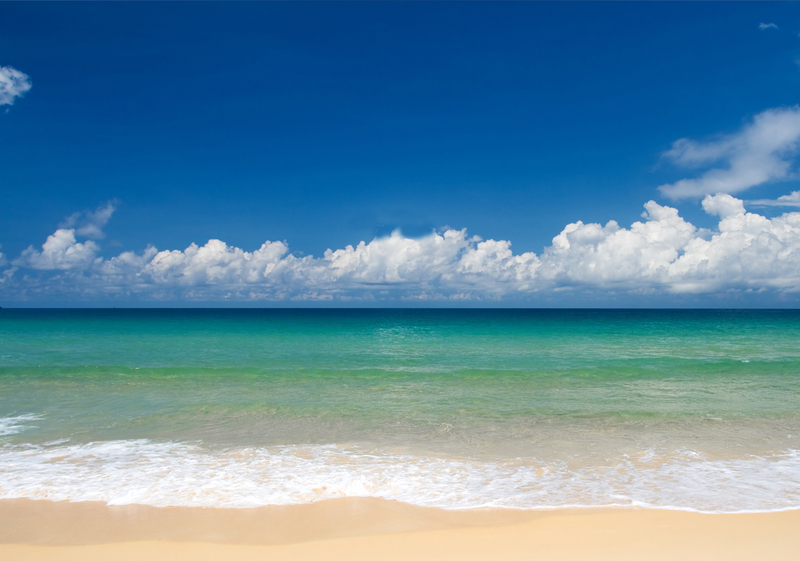 If the beachfront property was duly homesteaded and registered before 1977, it holds the privilege of being determined as titled and registered so with an individual or corporation. 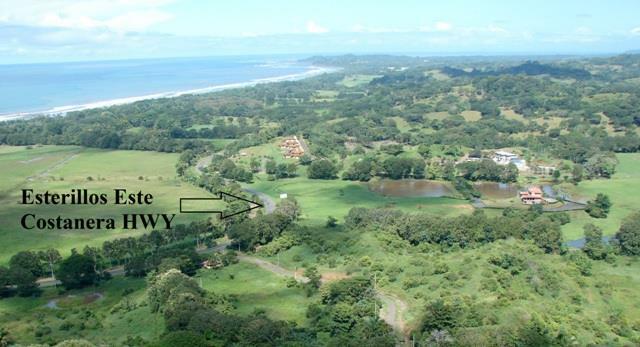 This is the case in Jaco, Costa Rica, where one family (the Diaz Family) homesteaded, owned and registered the entire strip of land along the beachfront. 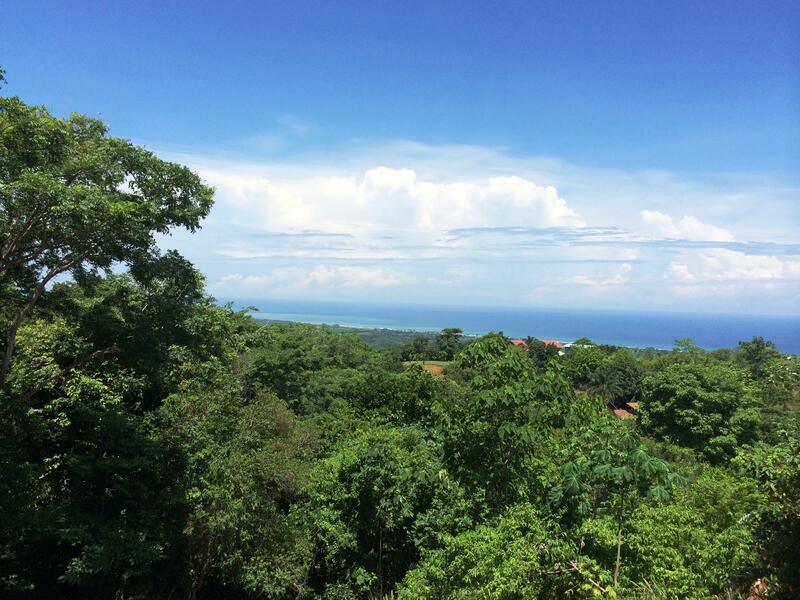 As a result, today the coastline of Jaco is considered premium real estate and is developing rapidly. If the property was not titled before the law went into effect, it’s either not been registered or surveyed at all (think very rural areas of Costa Rica, and DON’T BUY UNREGISTERED PROPERTY!) or it has a registered concession (which is a lease from the local municipality). With concession property, you can build or operate a business on the land and you do own that structure, but not the dirt beneath it. Each municipal has their own terms for how long they will grant the concession and the taxes and fees for that concession. Concessions vary from 5 to 20 years and are in most cases renewable. If the local municipality wants to take the land back, the law states that they must pay you for the structural improvements made to that lot (at what THEY deem is fair market value). Not many local municipalities have the money to buy back a multi- million dollar building. However, they can also raise your taxes inordinately, so it pays to know what kind of local municipality you are dealing with! If you concession is not up to date with correct paperwork and tax receipts, beware! That concession could be taken away from you without compensation. The disadvantages to concession property besides that obvious fact that you don’t own the land, is that your concession can be cancelled if the local municipality needs the land back (for a road, airport, hospital, save the turtles, etc). Also, your taxes are higher in the concession zone and you will have to have someone with legal residency status (like a Costa Rican) to be the majority shareholder of your corporation that owns the concession. In other words, it’s a risk, but it can be a calculated risk and if you really need to be BEACHFRONT in Costa Rica at a bargain price, concession can work out for you, as long as you do your due diligence, have a good professional lawyer and solid plan for your property. It’s as simple as asking your realtor (assuming that you have an ethical realtor), the most important questions right off the bat. Is the land advertised titled or concession and what are the terms of the concession. Jaco beach is one of the few beaches in Costa Rica that is 100% titled beachfront, as well as certain lots just south at Playa Hermosa. The boom along these beaches is evidence to the attraction of titled beachfront, but it’s much more pronounced in Playa Jaco as it’s beginning to look like “Jacopulco”. For more information on this and where you can find titled beachfront in this area, give me a call! Life in Costa Rica, PURA VIDA! Here are some fun photos I've taken in the Central Pacific, Costa Rica area with captions. One of the reasons why I love Costa Rica is that the dogs here are as friendly as the people! This photo was taken at the extreme north end of Jaco, a cove called "Monkey Beach", that can only be reached at low to mid tide. There are few leash laws at the beaches here. If your dog is aggressive, you will be asked by locals and tourists alike to put it on leash! 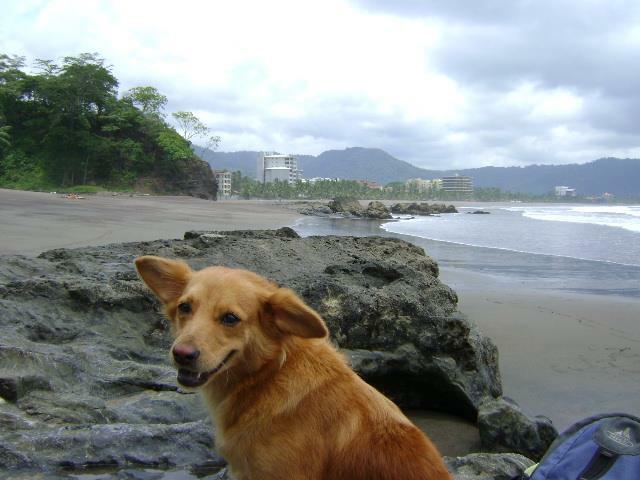 However, most Costa Rica beach dogs are friendly and inquisitive and love to run free. Motorcycle riding on beautiful country roads. 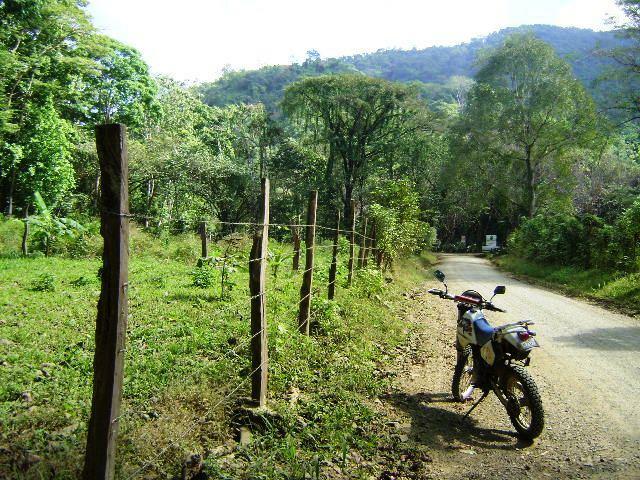 You can ride to your hearts content here as dirt roads connect beaches and small villages to the paved Pacific Coast highway called "La Costanera" which is Highway 34. Many roads in this area (not including the highway) are not paved. With the exception of Jaco (all roads are paved) and Herradura/Los Suenos. Helmets are mandatory.